Richard Parker makes an appearance on my blog post again. As if one tiger is not enough, here are multiple tiger heads for all you “Life Of Pi” fans out there. I wore this a few months back to a day of errands at the mall. Of course, I wasn’t in heels the entire time. Let’s be real. We all know how much of a klutz I am in heels. Anyway, back to my Richard Parker outfit. If I were to pretend there’s any symbolical meaning to my outfit, I can claim that I intended for this pairing to signify the scene in the movie where Richard Parker goes into the forest. But really, I just threw these things together because I thought they looked good together. That, and the fact that this skirt is so easy to spot in my closet. 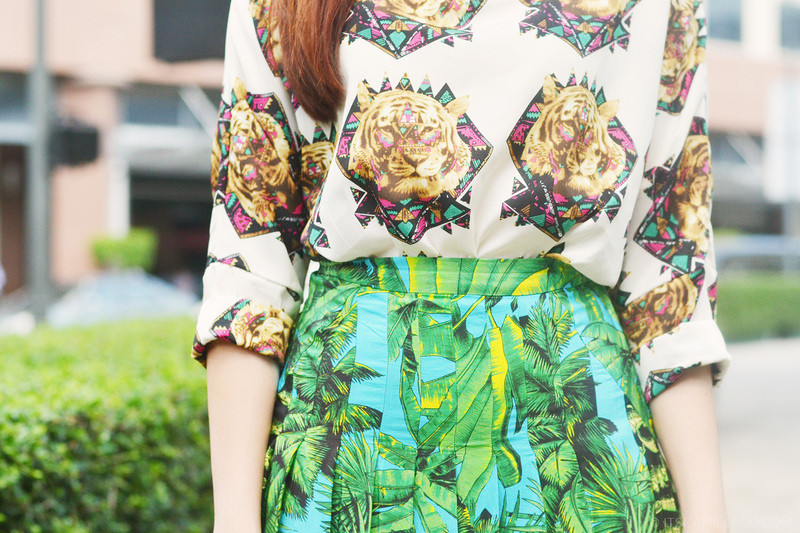 The mixing of prints here is fantastic! I love your style ! The look is very original, and fresh! The 2 pieces work very well together. Love this look but not really loving the black pumps.. looks too bulky.. white shoes will looks more suitable in my opinion.. but you looks young with this look, Ms Camille!! I love that you use SM accessories. This is one of my fav haunts when I go back home and I’m happy to see that SM has a wide range of accessory offerings to different generations. what a grace you have with every dresses!!!!!!! I might say I envy your legs! long, flaw less..at walang ugat ah wow! amazing outfit! 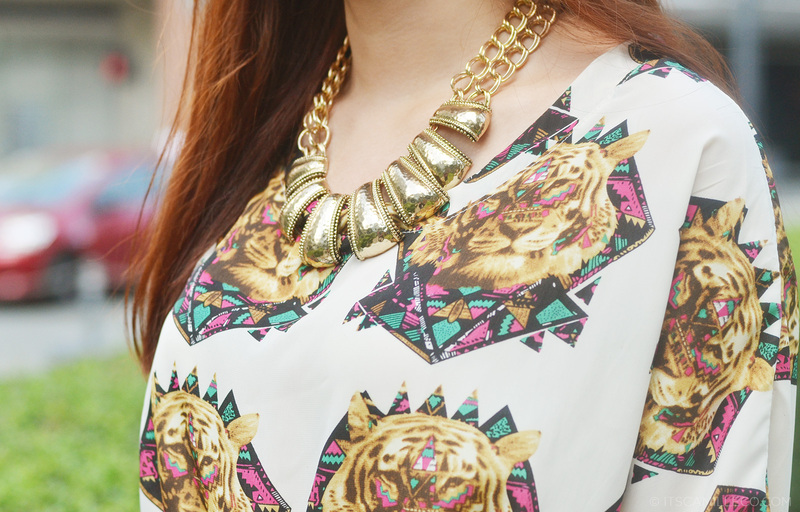 the skirt give a fresh look and your tiger top match perfectly with it. I always love how you paired patterns! This is what you call summer paradise!! I remember the movie Life of Pi. I think I’ve watched twice already with my mom and still planning to watch again. Its really a great movie, isn’t it? Like the patterns and the color combination of the clothes. I really love what you wearing. More Power to you camille:). love the outfit. :) Summer na summer lang ang dating. Haha! :) Awww don’t cry! i love ” Life of Pi”…i wish i can have that blouse too…:) nice one Camille! Am I the only guy who reads your blog? HAHA. Cool, prints on prints. Straight guy? I think there are a few of you here! Let’s do a survey one time haha! Light na light! :) Thanks Trisha! It proves how much I adore you <3 naks! hahaha! Love you style! Iba talaga ang galing mo sa pag pair ng prints to prints. I mean, wow kasi that is a hard thing to do. I really think you mastered it already. Wala akong guts diyan eh. Ow. Sana makita kita ulit. :) See you soon? hahaha. BU5! Yipee.